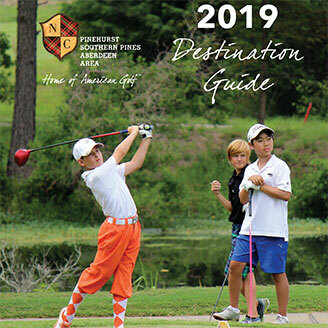 Longtime ‘Home of American Golf,’ the Pinehurst, Southern Pines, Aberdeen Area of North Carolina is a great destination for golf getaways with your kids, where 40 courses in a 15-mile radius feature world-renowned greens. In fact, out of nearly 600 golf courses in the state of North Carolina, local courses occupy four of the Top 10 spots among the state’s Top 100 Golf Courses and eight of the Top 25 spots. 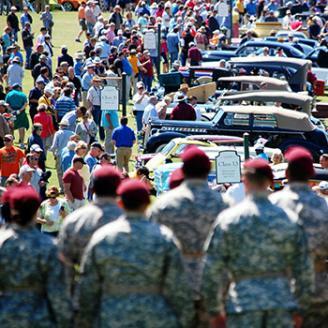 Great golf has been a local tradition since the early 1900s (see video) when many wealthy people stopped in this area as they drove from their homes in the northeast U.S. to vacation in Florida, and then established roots here. A gentleman named Donald Ross came from Scotland, too, and became the pre-eminent golf architect of the early 1900s through 1940s. His masterpiece courses include Pinehurst No. 2, the site of the 1999, 2005, and historic back-to-back Opens in 2014, and future 2024 Open Championship, as well as Pine Needles Lodge & Golf Club, which hosted the U.S. Women’s Open in 1996, 2001 and 2007. 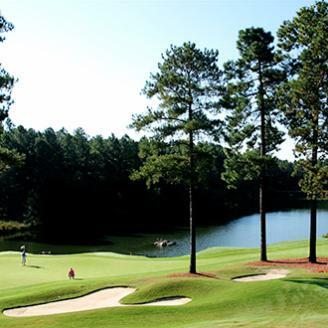 Today, the Pinehurst, Southern Pines, Aberdeen Area remains a premier golf destination full of lush fairways that appeal to all ages, but it is a great place for families to play together as well. The Cradle at Pinehurst Resort is a nine-hole short course that even the newest to the game can enjoy. Or play “Bottlebrush” at Longleaf Golf & Family Club, a short course of 450 yards in total comprised of 6 holes varying in length from 50 to 100 yards. The area features plenty of terrific restaurants and shopping boutiques too, which are well worth exploring if you’re not golfing. When an entire family spends their time golfing together while on vacation, special deals and packages can have a big impact on the affordability of a trip. You’ll find plenty of great information about local packages and deals on our website for the Pinehurst, Southern Pines, Aberdeen Area. Pinehurst Resort’s Summer Tee golf package offers a third night and a fourth round of golf free if you stay two nights. Participants enjoy a breakfast buffet and a three-course dinner each day, as well. In Aberdeen, the summer package at Legacy Golf Links includes play at three courses and a two-bedroom golf-front condo on the Pinehurst Resort Golf Courses. The Residence Inn by Marriott in Southern Pines features a rather unique summer package – a night’s lodging and a Featured Flight (Beer Tasting) at Southern Pines Brewing Company – sure to be enjoyed by the adults in the group. You can play three rounds at your choice of nine courses in Golf Escapes of the Sandhills‘ Summer Escape package and stay two nights at The Best Western, or in a 2-bedroom, 2-bath Pinehurst condo, either at very reasonable rates. Mothers, daughters, cousins and friends might enjoy sharing a ‘Golfari’ at Pine Needles Lodge & Golf Club. These females-only gatherings take place in the quaint town of Southern Pines, which lies approximately four miles from the Village of Pinehurst. With a course designed by legendary golf architect, Donald Ross, the property has previously hosted three U.S. Women’s Opens. Available in February, May and September, Golfaris include five days of ladies-only personalized instruction. Guests stay in rustic, chalet-style lodges and receive playing privileges across the street, at Mid Pines Golf Course. Some of the world’s greatest young golfers convene in the Pinehurst, Southern Pines, Aberdeen Area each August, as 6- to 12-year-olds from across the globe come to demonstrate their skills, at the U.S. Kids Golf World Championship. More accomplished on the course than many adults, they train 365 days a year just to reach this tournament. The competition among these youngsters can be fierce and they demonstrate incredible focus and talent. At the U.S. Kids Golf Academy inside Longleaf Golf & Family Club, kids have terrific opportunities to improve their golf games too. The comprehensive curriculum accommodates every age and skill level with a goal to make golf a favorite family activity. Academy courses include use of equipment, and a complimentary video analysis of individual golf swings. But more importantly, the Academy believes that optimal performance happens when people are having fun! For a fun look at the lives of eight of the world’s best 7-year-old golfers watch, “The Short Game” trailer (see video). Children can also attend Pine Needles’ Youth Summer Camps, for ages 10-17, or check out Pinewild Golf Academy at Pinewild Country Club. Featuring 2- and 4-day general golf education programs, and a short-game school, the Pinewild Golf Academy utilizes computerized swing analysis for instruction, too, as well as club fitting service. With a 4:1 student-to-teacher ratio, Pinehurst Golf Academy at Pinehurst Resort hosts weekend and week-long schools in addition to academies that accommodate juniors, or parents and their children. Work on your skills at the practice range and then put them to the test during a round of golf. A video swing analysis and individualized club fitting are other parts of the package. Enrollment covers resort accommodations plus breakfast, lunch and dinner, too. But golf isn’t the only game in town (see video). When you want to take a break from the links, there are plenty of additional family-friendly activities available, which include challenging disc golf courses at Reservoir Park in Southern Pines or Hillcrest Park in Carthage. You can travel along eight treetop ziplines with ZipQuest in Fayetteville, or get close to nature along walking and hiking trails that operate throughout the Sandhills area. Play some tennis, and then let the kids blow off steam on playground equipment in several area parks, or explore natural beauty with other family members from inside a rented canoe or on bicycles. The splash pad at Rassie Wicker Park is a zero-depth, 2,500-square-foot pad that features a variety of water sprays. The splash pad has multiple water features, including floor geysers, a big bucket water dump, and rain shower curtain for kids to cool off on hot summer days. For indoor fun, kids can run, jump, climb, crawl and slide inside the 4,200-square-foot Play Escape center, where a coffee bar and cafe is the perfect relaxation spot for watchful adults. At Discovery Place KIDS Rockingham, youngsters can learn about science through interactive exhibits, and demonstration experiments that occur during daily programs. It’s a great place to explore the scientific world with hands-on activities. In addition, family members can exercise their artistic creativity at The Ninth of September, in Southern Pines, during Paint Your Own Pottery events. Older children and adults may enjoy taking a self-guided historic walking tour, which provides a glimpse of this area’s storied past. In Pinehurst, you’ll view 32 quaint cottages that were constructed in the late 1800s, which has earned this village designation as a National Historic Landmark, or visit House in a Horseshoe, where a Revolutionary War battle took place. You’ll find many award-winning links among dozens of golf courses that operate in the Pinehurst area as well as other terrific ways to enjoy the outdoors or have fun indoors. For comprehensive information about golf packages or additional family activities, explore more of our website.